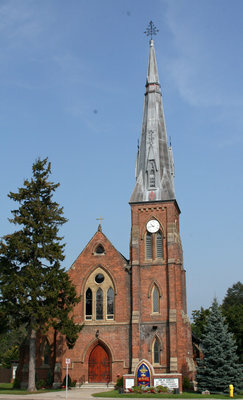 A colour photograph of All Saints' Anglican Church. View is of the front of the church from Dundas Street. The left window and circular window are clear glass windows. At the date of this photograph the windows were undergoing conservation treatment due to the fire on December 14, 2009. Click the link on the right side of the page to see the same view from May 1964. All Saints' Anglican Church, September 10, 2013, Sarah Ferencz. Whitby Archives D2013_006_041.